The Digital 2019 Reports are out, and as always, the reports bring a wealth of information for brands. There is some incredibly interesting stuff within the reports. In fact, if you wanted to read them all, you’d have to sit down with a strong coffee and plenty of time to spare. We know you might be a bit short of time right now, so we thought we’d jump right in and bring you the information that we think is most important for brands. There’s some rather interesting stuff here. In January 2019, the ‘average monthly page likes’ data from the reports were encouraging. According to the data, the average monthly change was up by 0.13%. This may not sound like much, but the one thing it does tell us is that Facebook is still one of the best platforms to market through. A caveat is the fact that the quarter on quarter change is -2.2%. While that isn’t great news, it’s still an area to be reasonably confident about. A little more concerning (but not necessarily surprising) is the continuing slump in organic reach. It’s been understood for some time now that organic reach on Facebook (or pretty much any other social media platform) is crumbling away. 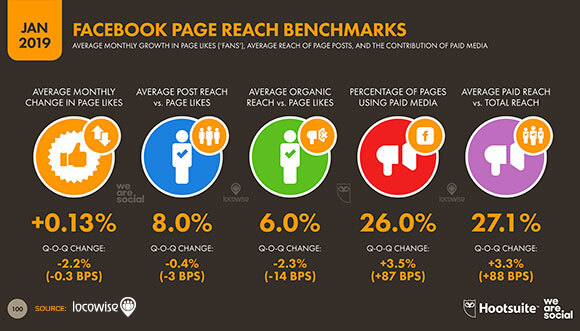 Average organic reach versus page likes came in at 6.0%, a -2.3% change on the last quarter. Paid reach on Facebook versus total reach is looking very healthy though. It comes in at 27.1%, with a 3.3% increase on last quarter. Again, nothing new, but it does show that paid reach continues to grow. 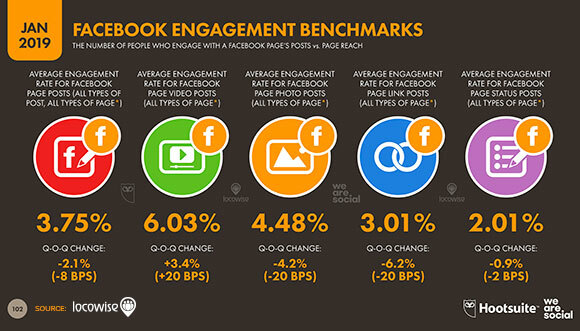 Facebook engagement is what matters, and the reports painted a vivid picture of what the state of play is regarding post type. This stuff is important, because there is, of course, the option to create a variety of post types for your Facebook campaigns. That option variety is becoming a more painful space though because the reports tell us that visual posts (video, photos) on Facebook are just storming away to be the preferred and most successful choice. The biggest loser is the page link post. This type of post has suffered massively, and the reports tell us that there has been a -6.2% drop in engagement rate for this type of post since last quarter. There’s nothing pretty about that, and while it’s still at 3.0%, the drop should be enough to scare marketers into reducing this type of posting. Right at the top of the tree is, predictably, video posting. The average engagement rate here is 6.03%. What’s even more pleasing is the fact that quarter on quarter growth was a comfortable 3.4%. So, again, video is where it’s at. One key comparison was around Facebook page size. The reports looked at pages that had less than 10,000 fans compared to those with over 100,000 fans. Now, this was interesting. With pages that had fewer than 10,000 fans, the engagement rate on average was 4.68%. 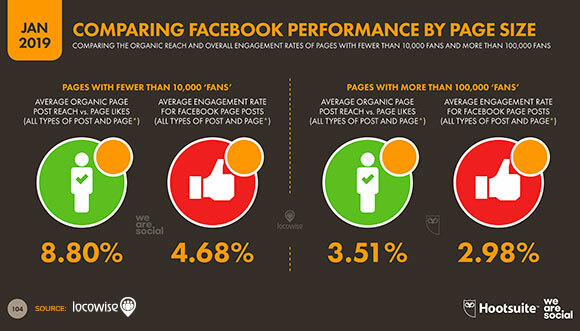 Pages that had more than 100,000 fans saw the average engagement rate come in at 2.98%. Obviously, this shows that percentages can dilute as fan numbers grow. But it also shows that smaller pages can, technically, outperform bigger pages. If any lesson is to be learnt here, it is that size really isn’t an issue (well, not as much as it used to be). A modest following can still enjoy good levels of engagement, relatively speaking. So that means, as long as a brand is focused on producing content that engages, it really doesn’t matter if you’ve got fewer than 100,000 fans. Using what you have effectively makes for a more positive outcome. Essentially, it means knowing your audience and giving them value. A small company can do that just as effectively as a large company. Of course, the reports covered a wealth of information. For example, global Internet use has grown by nearly 10% since 2018, to nearly double what it was in 2014. There is a big story in content too. Video continues to dominate most comfortably and 92% is the figure for the marketers to think about. That’s 92% of Internet users, watching videos. The audience profile aspect is worth thinking about too. The reports looked at women and men, and their corresponding size as an audience. The reports found that the gulf between men and women users on Facebook is shrinking. So that’s our look at the Reports. Basically, the Internet is growing, it’s visual or no engagement, and brands should focus all efforts on paid for ads. 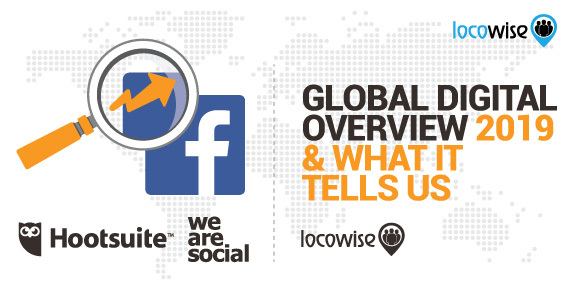 How would you like to get your hands on some of the best social media data around? Thought so. Sign up for a free trial of Locowise. It’s just what you need.